I am having an issue where the Menu header text (of the menu tab) is not fitting correctly in the player. This occurs on multiple PC's published by multiple people, and in bother course preview mode and the HTML5 output files. Player Preview, which is the player being shown in the preview mode, where you can clearly see that "Menu" fits and is not distorted. Course Preview, in which you can see the Menu tab is now distorted once the course is previewed or launched. Thanks, Justin, for reaching out about this. I've seen a similar problem happen when the player font size is set to something larger than 100%. What is your player font size set to? Also, what version of Storyline are you using? It's almost like there isn't enough padding between the Menu and Glossary Tabs and the menu text fields. Update: On top of the menu and glossary text being cut off by the textbox, the player coloration of an HTML5 published module is now GREY instead of white. No idea. It looks fine in preview mode, but HTML5 output changes the play settings and adds a "Play" button to the course. Images attached. Notice how ugly the first one looks with the orange button and the greyed out interface. NO WHERE In my settings do I require a play button like that to appear. 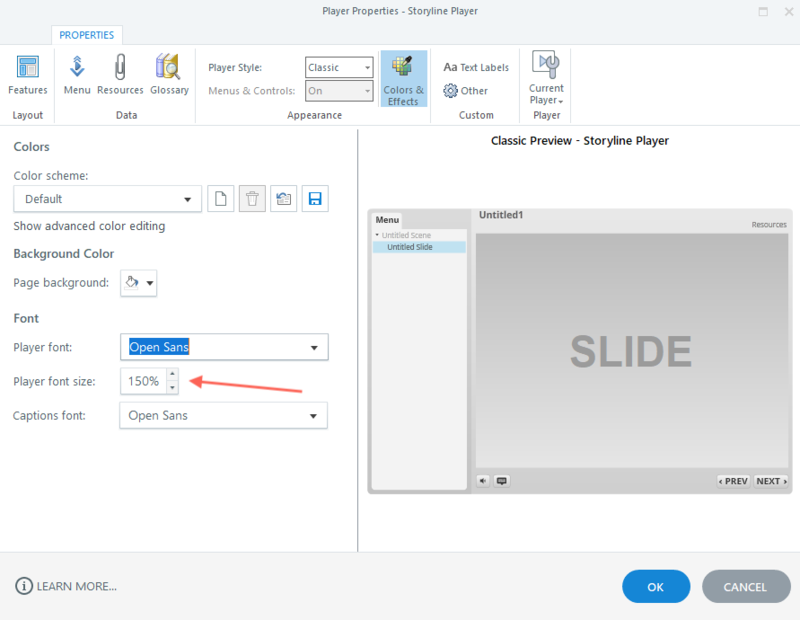 Thanks for confirming your player settings and that you're using Storyline 3. We'll let you know as soon as this issue is resolved. Now, on to the orange play button that appears on top of your content area. Does this appear in all browsers, or just one browser in particular? Also, do you have audio or video on the first slide of your course? Any updates on this? Also just some audio on the first slide, set to play on a hover effect. Hi there, Justin. Thanks for checking in. No changes just yet. We have this issue documented, and we'll let you know of any upcoming releases that addresses this behavior. Currently, the workaround is to keep player text size to 120% or lower. An earlier release solved Chrome and Safari blocking autoplay of content by including a play button on the beginning of courses that contained audio or video on the first slide. That play button was showing erroneously in Firefox, and it should have been fixed in update 5 for Storyline 3. A quick little project I created with audio on the first slide set to play on hover doesn't show a play button in Firefox. Can you confirm what version of Storyline you’re using? Go to Help > About Storyline. If you're still seeing the play button in update 5 output, I'd love also to have a look at your file. You can attach it here or send it to me privately!